Our Bed and Breakfast is located in downtown Orange, Texas on Pine street. 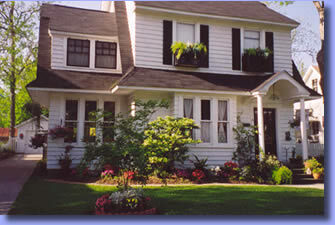 It is the only bed and breakfast off of the I-10 corridor between Houston and Lake Charles. It is easily accessible. The house was built in 1927 by a family who sold it to Mr. Tom Rogers in 1929. A courtly old gentleman with a great sense of humor. 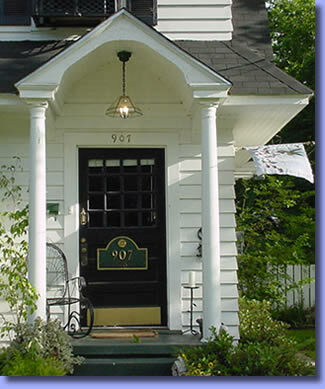 You will feel pampered during your stay in this charming Cape Cod style Bed and Breakfast, in the heart of the Historical District in downtown Orange. It is a perfect setting for you and that special someone to relax and get away from the big city hustle. Wake up early in the morning to the sounds of birds or the bells ringing in nearby churches. Enjoy your first cup of coffee in the comfort of your room, on the upstairs veranda, or on downstairs screened porch. A light breakfast of juice, muffins, and fruit are usual fare. Whether you come just to relax or to enjoy the nearby theater, museum, casinos or visit family and friends, you will leave The Rogers House feeling refreshed. We are located in the heart of downtown Orange, a few blocks from the Orange County Courthouse, walking distance to the museum, theater, and churches. We are a short driving distance from Beaumont's Crockett Street Entertainment Area, Southeast Texas Entertainment Complex and the Louisiana Casinos. Our guest rooms are very spacious and feature very comfortable beds with superior linens, designer furnishing, private bathrooms, terry robes, individually controlled a/c, ceiling fans, televisions, telephones, and comfortable seating. We want our guests to have the best time possible while they are in Orange! The quintessential charm of 19th century Orange awaits you in this graceful southern house, lovingly restored and furnished by your hostess. 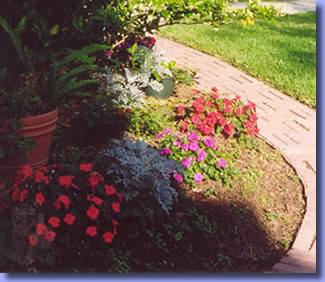 Gardens and fountains, oaks and camellias, loads of flowers,and flagstone terrace and gazebo complete the ensemble. Orange is rich in history and there is growing and enthusiastic interest in preserving and refurbishing the beautiful old homes in the area. Pine street boasts some of the most beautiful homes and oak trees in Orange. Cancellation policy : You may cancel up to seven days prior to your scheduled arrival. In consideration of other guest, we are unable to accommodate pets. We are also pleased to offer our guests a "Smoke Free Environment".